HTC is a wonderful manufacturer permanently hamstrung by its devices all being Windows Mobile. Ain’t that the ever-loving truth. I have an HTC TyTN II, which at the outset seemed to be a great little machine, but now it no longer switches screens back and forth between landscape and portrait when you open it; the battery is dying after six months; the touch screen is imprecise and incredibly slow, leading to mouse-aheads and dead ends; I have not been able to connect it to my PC (despite good friends trying to teach me, but when it comes to mobiles I reserve the right to be a moron); the underwhelming synchronization interface has doubled most of my contacts (in the process slowing the whole thing down even more); and worst of all: The Windows Mobile OS, initially quite nice despite its propensity to leave everything running, has acquired more and more barnacles with use and now is just soooo daaarn sloooooooooooow. Inside this unnecessarily complicated little thingy is a very useful set of soft- and hardware struggling to get out. I just can’t see that most users can be bothered with the digging any more. What to do? Returning the thing to the local IT department. I need a life. And, if Stephen has any sense at all, an iPhone 3G. This entry was posted in Nerdy ruminations on July 28, 2008 by Espen. Bob Cringely has a nice hand with metaphors, and his SAP/Squirrel analogy does it for me (though I have a sneaking feeling that if GuiXT really had been THAT simple, the cat would have been out of the bag a long time ago.) The truth, methinks, is that understanding what those numbers mean is just hard, no matter what, and no amount of interface fiddling is going to change that. SAP is a new basic element, but contrary to other basic elements, which go from solid to liquid to gas as they heat up, SAP has a different cycle. It starts out as a liquid: You pour it into a hole in the business – where functionality and control is lacking – and it fits perfectly as you install it. Next, it goes into gas form, expanding until it fills the whole business as you add modules. Then it becomes a solid, hard to change, so you have to shape new business processes around it. This entry was posted in CIO corner, Humor on July 12, 2008 by Espen. Mary B. has this account of finding interesting material bound with another book from the library – and then discovering that all the stuff was available through Google Booksearch. Which raises the point – how to we make the serendipity often found in research (go into any library and look at the books next to the one you are looking for) in an electronic context? Online newspapers (as well as domain squatters) face this challenge every day – not just serving what the customer wants, but also something they didn’t know they wanted, often sufficiently similar that it may be, if not a substitute, at least a diversion. Perhaps Google should have a new subcategory on their result screen – an appropriately random link under the heading of "and now, for something completely different…"
This entry was posted in iAD, Search on July 11, 2008 by Espen. George Will describes how beer was essential as a water purifier and human selection mechanism as the world urbanized and industrialized. This, of course, is different from Clay Shirky’s theory that rising alcohol consumption came because people had too much time on their hands and needed to burn off surplus synapses. Personally I think it was the more mundane effect of lower unit cost due to more centralized production to serve a denser urban market, but who am I to spoil an interesting theory during cucumber season…. I need a beer. Need to feel more civilized…. This entry was posted in Academically speaking, Business as unusual, Humor on July 11, 2008 by Espen. 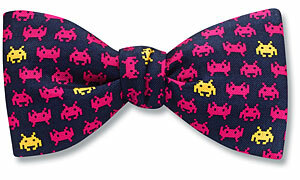 The traditional geek (or nerd) attire usually includes a bow tie, and since not many people wear them anymore (though some pretty interesting people did), I suppose any bow tie, taken seriously, is a geek bow tie. 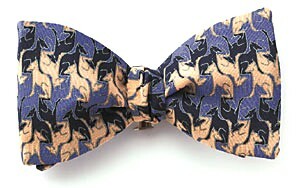 According to my good friend Bill Schiano, there are only four professions allowed to wear bow ties: Lawyers, physicians, academics – and circus clowns (more on this here.). Initially I wore bow ties in deference to my two academic mentors, Jim and Benn, the latter who refers to his bow tie wearing as a "cheap way of earning distinction" among other reasons. Now I wear them because, well, I got used to them. 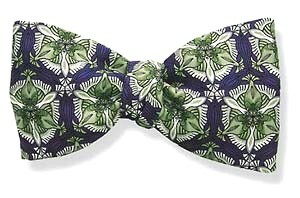 Beats fashion, and according to the New York Times, the bow tie is back this year. That’s the great thing about being obstinate about your wardrobe – sooner or later everything will be in vogue again. 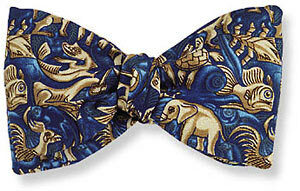 Incidentally, the only real bow tie is a self-tied bow tie. Instructions here. Make sure you don’t tie it too perfectly, though – slightly askew is the thing, aim for rakishness bordering on the sloppy, an at all cost avoid the pre-tied curse. 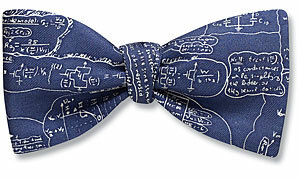 As all geeks know, the Internet is shaped like a bow tie, which is another reason for wearing them. At least it used to be, though this figure is Web 1.0, created before blogs and social software became prevalent. I assume a more current version would have a beefier knot. A side effect of bow ties is that they provoke people, something I have found to be true on panels and other discussions, even on TV. It helps your argument because your opponent is busy looking at your neckwear and you can surprise by being more reasonable than people thought possible. I may backfire if you take yourself seriously and get Jon Stewart as a visitor (video), but overall the effect is good, methinks. Besides, your students will remember you, even if you don’t. This entry was posted in Nerdy ruminations on July 8, 2008 by Espen. Here is a bunch of links about Google that I have had lying around for a while – trying to think about the first one and to what extent Hal Varian is right about Google not having a network externality competitive advantage. I think he is wrong, but why is hard to articulate. Hal Varian: Our secret sauce, arguing that Google’s competitive advantage is due to experience and innovation, not network externalities. Tom Evslin: Sitemaps and how the rich get richer: Essentially, Google has an advantage because they are the biggest and people adjust their web sites to the Google engine and its various algorithmic quirks. Hal Varian: Why data matters. Brief overview of search and PageRank. Hal Varian: How auctions set ad prices. Brief explanation of Google’s auction system for ads. One interesting effect, not mentioned here, is that the more precisely the user can describe the targeted population, the lower the ad price – thus, Google has both an incentive to make targeting imprecise (to have enough actors competing for a particular keyword/target) and an incentive to make it precise (to increase click rates). Marissa Mayer: A peek into our search factory. Various presentations, with notes, about the infrastructure underlying Google’s various offerings. Ghemawat, S., H. Gobioff, et al. (2003). The Google File System. ACM Symposium on Operating Systems Principles, ACM. Description of the architecture of Google’s index, a file system geared for few writes and very many reads, redundancy, and low response time. PDF here. This entry was posted in iAD, Search, The thoughtful manager on July 2, 2008 by Espen. The long tail doesn’t work, according to Anita Eberle. Chris Anderson, rather sportingly, likes the article but begs to differ when it comes to determining how long that tail should be. Maybe it is a tall tail? This entry was posted in Academically speaking, Business as unusual, Electronic Commerce, The thoughtful manager on July 1, 2008 by Espen.